We've already seen leaked photos of the alleged low-cost Xperia Z1 variant, and Japanese carrier NTT DoCoMo even unveiled a 4.3-inch version of the 5-inch flagship called the Z1F. 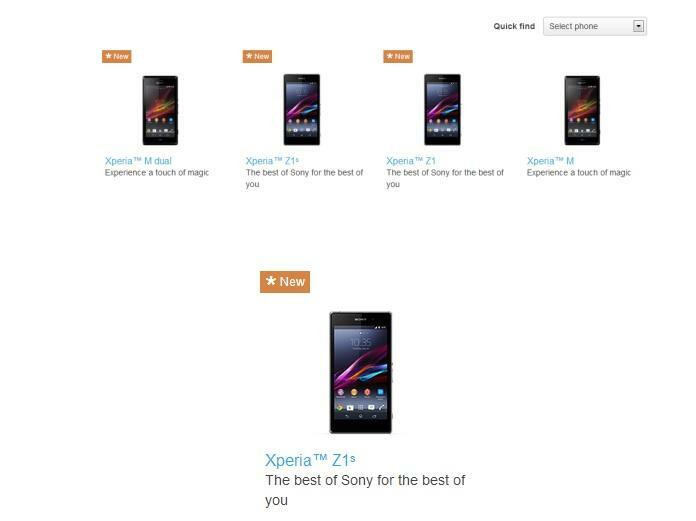 But now it looks like Sony may have accidentally leaked the international version on its website, briefly listing a new device called the Z1s before quickly scrubbing it from page, though not before Xperia Blog could grab a screenshot. There's no word on specs for the Z1s, but going off the Z1F, we're expecting a scaled down device with some serious power under the hood. The Z1F comes equipped with a quad-core 2.2GHz processor, a 2,300mAh battery, a 4.3-inch 1280 x 720-pixel display, 2GB of RAM, 16GB of storage, a powerful 20.7-megapixel camera and Android 4.2.2, though hopefully the Z1s will run Android 4.3 or possibly even Android 4.4 KitKat. Sony's render of the Z1s looks extremely similar to the Z1. The Z1F also features a near-identical design including its distinctive circular power button, though the smaller device sports more pronounced curved corners than its big brother. The Z1F comes in black, white, pink and lime options, so we expect the Z1s to offer similar color choices.